Attending a competition like King of Dolomites leaves little time to sleep. Its the battle of light, and only kings will survive. The last day of the competition was all we needed. Our winner image in the action category. Baard Oymar skiing this line right at me. We did it several times. My eyes were burning. Baard`s legs was burning too. 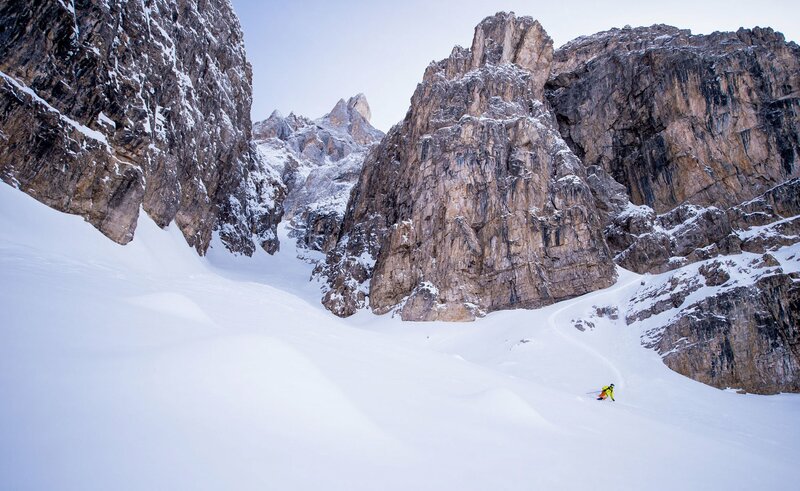 SAN MARTINO is located in the neighboring valley of Italy’s cross country mecca Val di Fiemme, and is more familiar to rally than for freeskiing. At first glance, San Martino fits into the stereotype of a hidden mountain treasure. A place were freeskiers love to have theire secret hideaway, but they refuse to talk about it. They would tell you; go there, but do not tell anyone about it, and I did not tell you about it! And once you arrive, it is perhaps more secret than good. Not that San Martino is a disappointment, but it’s not a new Chamonix. The ski lifts in San Martino is built as a classic modell. On the west side of the valley lies the sunny side Tombola facility, and on the east side of the valley the Rosetta lift takes you up in the alpine Dolomites. There you will find what have made the Dolomites famous. The colouir formations are so right angled, it looks as though someone carved them into the rocks with an grinder. 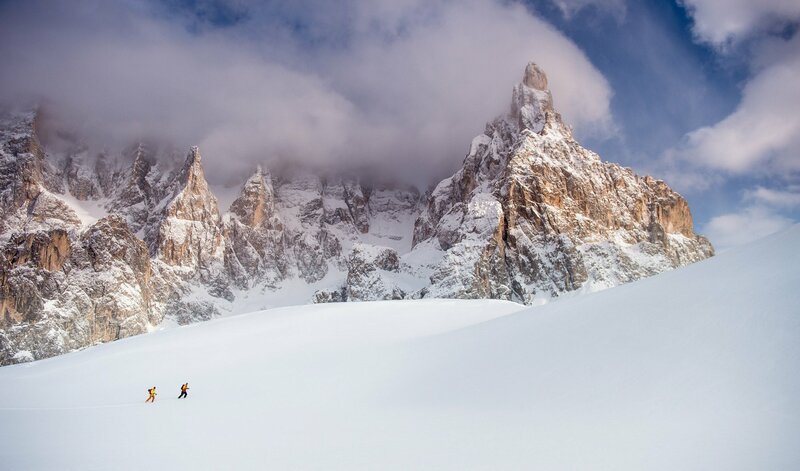 Seb Mayer and Baard under Cimon della Pala or Cimone as its called, the Matterhorn of the Dolomites. Our winner image in the landscape category. We were invited by the main sponsor Arcteryx and were accommodated at Hotel Regina. In addition to the owner’s doll collection, they have a wine list that was in style for the fashionable visit we represented. To Sverre`s liking. He must be one the most wine competent photographer I know of, and he was very excited to be able to call reception for quality wine when he sat and edited photos in the evenings. San Martino is located in the Trentino region, which together with the South Tyrol is part of Italy that are resembling just as much about Austria as Italy. The area was part of the vast Austro-Hungary until dissolution after World War I in 1918, and in the neighboring valley they still speak primarily German. Culinary it means that it is easier to come by schnitzel and goulash than carpaccio and caprese. In return, the beer served in norwegians sized cans, and not in two and a half deciliter glass that you risk in the rest of Italy. Seb Mayer find his line - this was our KOD Theme category contribution. Theme was "Its all about lines". 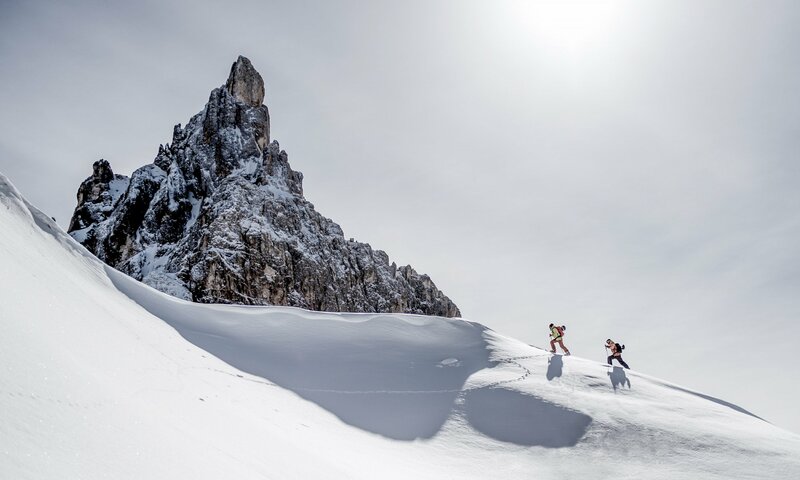 In King of the Dolomites, teams with one photographer and two skiers, battle to take the best pictures in the area. They have three days to finish. 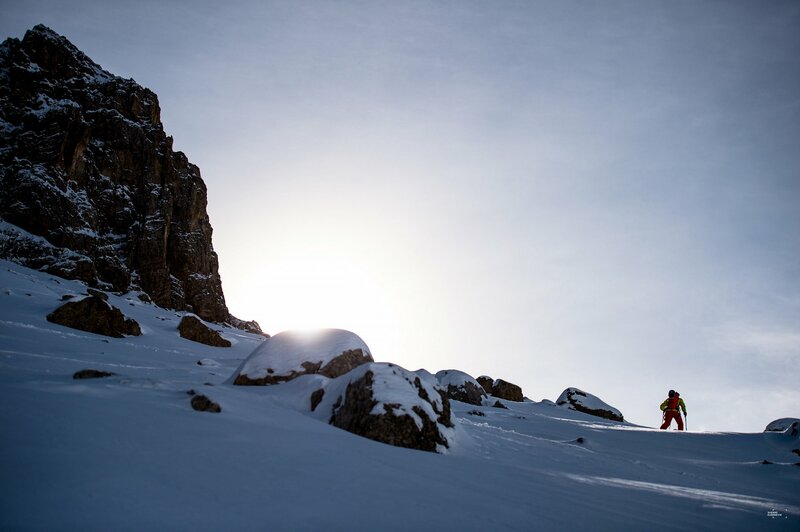 We teamed up with the French telemark skier Seb Mayer. He previously won the Derby de la Meije and was ready to help team Norway. In addition, he was smart enough to bring old skis ment for rocks. Unlike Sverre and I, we both arrived with fresh new 4Front Hoji`s. In the competition there are around ten invited pro teams, and two dozens of amateur teams. Our plan was to find out what all the others were doing, and then do the opposite. There are limited skiing in the valley, but we avoided the other teams as if they were our kryptonite. The first day we floundered around in the woods in Tombola without producing anything to remember. North from San Martino you find the mountain pass “Passo Rolle”. On the top you will find a small ski resort. A perfect starting point for hikes further into the mountains. The last two days we kept our eye here. We were surprised at how much better snow conditions this area had, and the terrain was perfect for evening sun. The drawback was of course that it is less efficient to take pictures when hiking. Shooting skiing is often a time consuming process. 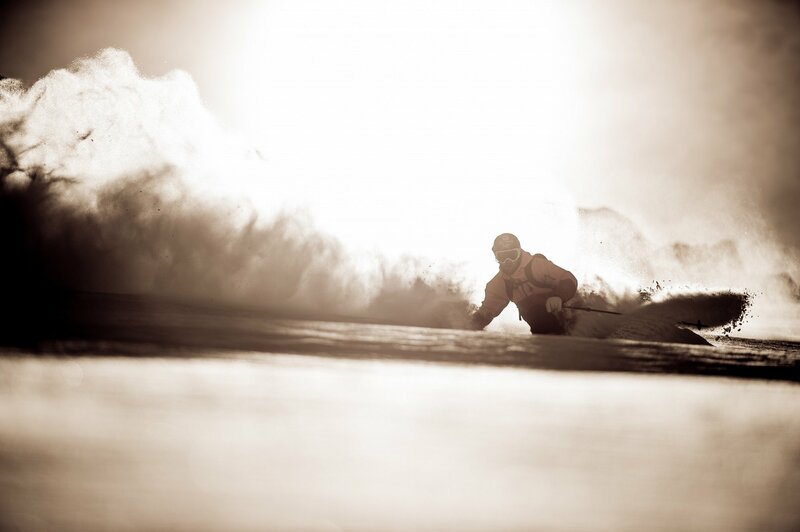 For the photographer, it is frustrating when skier misses the style or task. And for the rider is frustrating when what appers for the photographer as a awsome image, looks like a pile of stones seen from the top. Shooting skiing is often a time consuming process. Specialy when your skinning around to get your shots. As the sun was going down, Sverre found a place where he pointed the camera parallel to the ground and up against the sun. He asked Seb and me to skiing in the direction of the camera, spraying snow towards him. From our point of view, it looked like a white snowfield with hidden sharks. It’s hard to get it on the first attempt. Running up and trying again on the same image is normal procedure. Seb didn`t realy like norwegian work ethic, he went for the french solution, to strike. 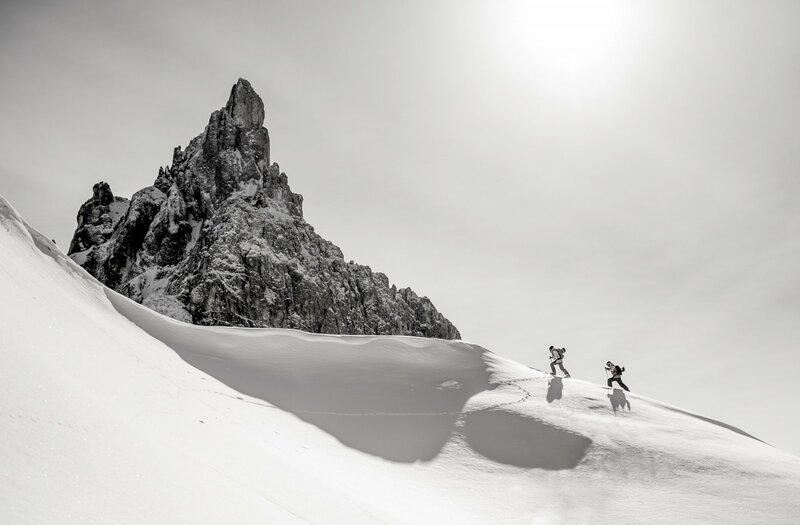 As a skier its not always obvious what the end result will be like, and it may soon seem pointless to put this much effort in repeating what has already been done. But when you eventually see the result, you finally understand what you’ve been doing for hours. In this case, the struggles payed of. The picture of me won the category of best action during the competition. It shows more than anything else that a good photographer will find scenes where others do not see anything other than a rockery. Baard heading for another run to capture that winning image. So Seb and I was running around in the mountains during daytime, Sverre had the struggle of late night editing contributions to the competition. And as the quality of the pictures increased, naturally the quality of wine consumed in the prosess followed the same curve. Fortunately our images was winners in two of four categories. We were given two huge checks. In reference too the size of the cardboard, not on ammount written on them. We packed our checks and traveled to Venice to spend them. 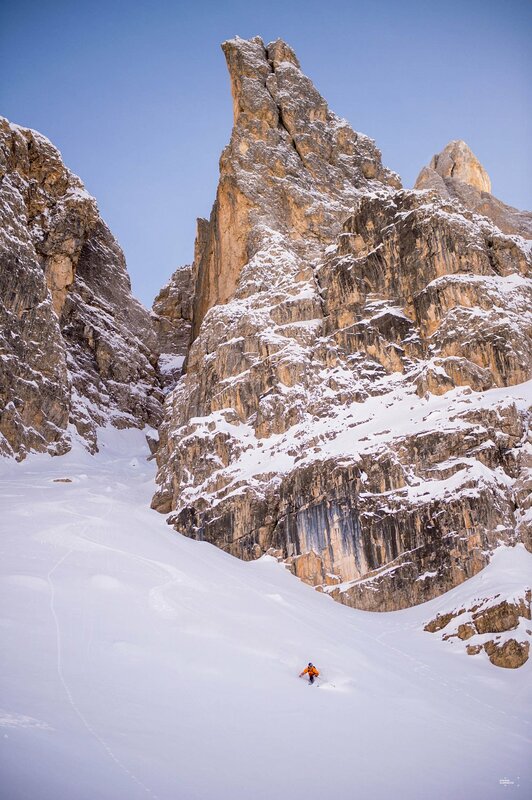 One more line from the last day in Passo Rolle. Next stop Venice!